Trump Warns Summit With North Korea May Not Happen On Schedule "There's a chance, there's a very substantial chance that it won't work out," President Trump said of the June 12 summit with Kim Jong Un. Trump met with South Korea's president Tuesday. President Trump meets with South Korean President Moon Jae-in on Tuesday in the Oval Office of the White House. 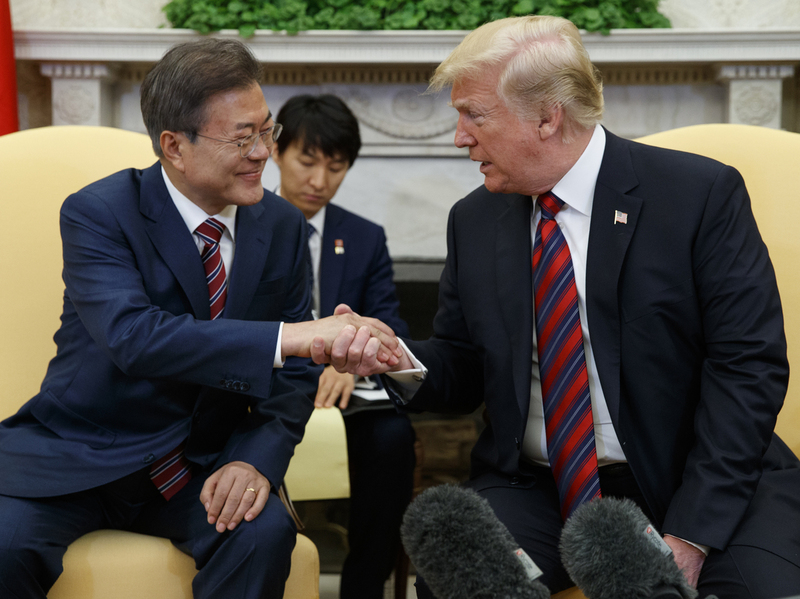 South Korean president Moon Jae-in is eager to keep the meeting on track, in hopes that North Korea can be persuaded to give up its nuclear program. Earlier, South Korea's national security director told reporters that his country is confident the Trump-Kim meeting will go forward. "We believe there is a 99.9 percent chance the North Korea-U.S. summit will be held as scheduled," said Chung Eui-yong. "But we're just preparing for many different possibilities." Chung added that officials in Washington and Seoul have been coordinating closely in advance of the summit. Secretary of State Mike Pompeo, who has met twice with Kim in preparation for the summit, said the U.S. is still working towards the June 12 date. He declined to give odds on whether the meeting will come off on schedule. "I'm not a betting man," Pompeo said. "I wouldn't care to predict whether it will happen, only to predict that we'll be ready in the event that it does." After weeks of conciliatory gestures, Kim put the summit meeting in doubt by suggesting that North Korea is not willing to give up its nuclear program too easily. The Trump administration has insisted that Kim scrap that program entirely before granting any relief from economic sanctions. But Trump allowed there might be room for a more phased approach, as South Korea has suggested. "All in one would be nice," Trump said Tuesday. "It would certainly be better if it were all in one. Does it have to be? I don't think I want to totally commit myself." Trump also offered assurances that the U.S. would not try to drive Kim from power if he agreed to disarm. "We will guarantee his safety," Trump said. "He will be safe. He will be happy. His country will be rich." "Anybody who's looked at this issue for years knows that you don't get fairy-tale endings with North Korea," said Victor Cha, a Korea expert in the George W. Bush administration who was considered for a post as Trump's ambassador to Seoul. "It tends to be a lot more difficult and rocky and dirty and suspense-filled." South Korea's Moon continued to nudge Trump in the direction of diplomacy. "I have every confidence that President Trump will be able to achieve a historic feat of making the upcoming U.S.-North Korea summit successful and end the Korean war that had been lasting the past 65 years," Moon said through an interpreter. "Moon is a resourceful politician. He's played his cards very well. But there's just so much that could go off the rails here when and if Trump does, in fact, go to Singapore," said Jonathan Pollack, a senior fellow at the Brookings Institution. Trump hasn't always been on such friendly terms with South Korea. During the 2016 presidential campaign and since, Trump has complained about what he sees as that country's freeloading reliance on U.S. military might. "You look at what the world is doing to us at every level, whether it's militarily or in trade or at so many other levels," Trump told CNN during the campaign, "the world is taking advantage of the United States." expansion of a U.S. military base 55 miles south of Seoul. Trump is also unhappy with the U.S. trade deficit with South Korea, which topped $10 billion last year. Two months ago, the U.S. agreed on a revised trade agreement with South Korea. It limits steel imports from that country and extends a tariff on imported pickup trucks.